President Obama sent George Mitchell on another mission to the Middle East this past weekend. After meeting with both Israeli and Palestinian leaders, Mitchell found that nothing has changed. One full year on the job, and George Mitchell has been unable to find anything remotely resembling progress toward peace. His latest trip to the region began, and will end, under a cloud of failure. Barack Obama has admitted that his attempts to break the political deadlock in the Middle East by pressuring Israel to end the construction of Jewish settlements have failed. He said he raised expectations of a breakthrough too high because he underestimated the political obstacles involved – an acknowledgement that he was unable to force the hand of the Israeli prime minister, Binyamin Netanyahu. “The Middle East peace process has not moved forward and I think it’s fair to say, for all our efforts at early engagement, [it] is not where I want it to be,” he told Time magazine. Should the White House have assumed Bibi Netanyahu would respond in a positive manner when the President asked him to show restraint in dealing with the Occupation? Obama: Hey, Mr. Dependable Ally in the Middle East, we are only asking you for a token show of restraint. How about a few months with no new settlements? Israel’s response: New building permits for settlers, even more Palestinian homes demolished; a continuation of the Gaza invasion through economic oppression. My dictionary says an intractable problem is that which is not easily governed, managed, directed, manipulated, relieved or cured. It does not say the problem is impossible to solve. What would make this particular problem impossible to solve is for the President to continue down the road he has followed in his first year in office. It is time for some serious policy overhauling. It is time to face the ghosts of the past. When it is time for some serious ghost busting, who you gonna call? I suggest Mitchell try a new perspective. Call Henry Siegman. Mitchell was an honored guest in April, 2009, at the US/Middle East Project international board meeting in New York, the organization for which Siegman currently serves as president. Brent Scowcroft, Bush Senior’s National Security Advisor, is the group’s international board chairman. Siegman, a German-born American citizen, is a respected Jewish journalist. He knows the region and he knows the players. His most recent Nation essay was developed from abackground document he wrote for the Norwegian Peacebuilding Centre in Oslo, Norway. He served as executive director of the American Jewish Congress from 1978 through 1994. Those of us who worked with him in those earlier years can attest to the importance of his presence in the Middle East dialogue. His influence has grown considerably since those days. In addition to running the US/Middle East Project in New York, Siegman is currently a visiting research professor at the Sir Joseph Hotung Middle East Program, School of Oriental and African Studies, University of London. During Siegman’s time with the American Jewish Congress, that organization was often confused with the American Jewish Committee. The two could not be further apart. The AJ Committee rigidly follows the policies of whatever political party governs Israel. Under Siegman, the AJ Congress represented American Jews; it refused to parrot Israel’s increasingly right wing policies. As a recent example, in November, 2009, a delegation from AJ Congress met with Jordan’s King Abdullah to discuss American Jewish involvement in peace making. Israeli governments have avoided dealing with Hamas not because they fear that engaging the organization might not produce a peace agreement, but because they know they could not manipulate Hamas the way they have been able to manipulate Palestinian President Mahmoud Abbas – namely, by using content-less peace talks as a fig leaf for the continued expansion of the settlement enterprise. Our “special relationship” with Israel is unique in American foreign policy. We have funded and endorsed decades of illegal and immoral conduct by a nation claiming to be a democracy, while, in fact, it has hidden behind America’s protective screen, to build a racist state with policies antithetical to democratic values. A compliant and controlled American media, a bought and paid for Congress, and a succession of presidents intimidated by both the media and the Congress, have allowed Israel to create a false image of a democracy seeking peace. Israel’s current leaders believe they can continue to bamboozle the West into believing the state of Israel is so special that its colonialism is merely following the pioneering spirit of western colonial powers in the 19th and early 20th centuries. Israel just got to the party a little late. After World War II, colonialism was passe. Before the 20th century and modern communications, colonialism was known as “expansion”. Exploitation of indigenous populations by Western powers was viewed as a race to power. May the empire with the superior ordnance win! The American western plains and the jungles of Africa were not exposed to a 20th century technology that sees all and tells all. Modern Israel’s founding parents knew that modernity had created a different climate for empire building. Winning the hearts and minds of the western world, and selling the West on the Israeli narrative, has always been as important to Israel as having a powerful American sponsor for its military and economic development. Israel established its own “don’t ask, don’t tell”, agreement with the US. Don’t ask us, and don’t tell others, about our expansion plan and our Dimona nuclear program, and we will provide you with your very own colonial outpost in the heart of the Middle East. Those Israeli founding parents created an ethnic cleansing plan which had to remain hidden, because after World War II, ethnic cleansing was no longer kosher. It was not until Israel’s own New Historians, led by scholars like Ilan Pappe, began to dig into Israel’s pre-1947 plans to colonize Palestine, that outsiders could see the meticulous planning that allowed Israel to peddle itself as a new nation led by brave frontier fighters. Moshe Dayan meet Andrew Jackson. Israel’s relentless drive to establish “facts on the ground” in the occupied West Bank, a drive that continues in violation of even the limited settlement freeze to which Prime Minister Benjamin Netanyahu committed himself, seems finally to have succeeded in locking in the irreversibility of its colonial project. As a result of that “achievement,” one that successive Israeli governments have long sought in order to preclude the possibility of a two-state solution, Israel has crossed the threshold from “the only democracy in the Middle East” to the only apartheid regime in the Western world. When a state’s denial of the individual and national rights of a large part of its population becomes permanent, it ceases to be a democracy. When the reason for that double disenfranchisement is that population’s ethnic and religious identity, the state is practicing a form of apartheid, or racism, not much different from the one that characterized South Africa from 1948 to 1994. The democratic dispensation that Israel provides for its mostly Jewish citizens cannot hide its changed character. By definition, democracy reserved for privileged citizens–while all others are kept behind checkpoints, barbed-wire fences and separation walls commanded by the Israeli army–is not democracy but its opposite. The Jewish settlements, with their supporting infrastructure spanning the West Bank from east to west and north to south, are not a wild growth, like weeds in a garden. They have been carefully planned, financed and protected by successive Israeli governments and Israel’s military. Their purpose has been to deny the Palestinian people independence and statehood–or to put it more precisely, to retain Israeli control of Palestine “from the river to the sea,” an objective that precludes the existence of a viable and sovereign Palestinian state east of Israel’s pre-1967 border. Colonial enterprises conquer indigenous populations and make the land their own. Justice is not in their playbook; control is. Middle East peacemaking efforts will continue to fail, and the possibility of a two-state solution will disappear, if US policy continues to ignore developments on the ground in the occupied territories and within Israel, which now can be reversed only through outside intervention. 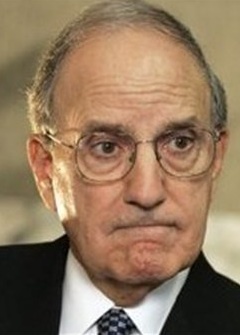 The picture of George Mitchell is a Ma’an Image. Henry Siegman’s picture is from the Council of Foreign Relations. I send an alert each week to a White House contact. Does it get past the front desk? I have no idea. But if this is still the White House of hope, there is no reason why we can’t hope they will see the value of Siegman for their future decisions. Of course, readers like yourself could send this posting to the White House. They already know where I stand. They don’t know where you stand. All they know is that you are a concerned citizen who will vote in the 2010 election. They might also be impressed to discover that you know the difference between J Street and AIPAC. Now what can we do to get this blog into the White House? I received a comment from a reader who wanted to know, like you, what she could do to get the Siegman writings more widely known. Thinking about that question, I offered the following response which, as it turns out, is something of a rationale for this blog. George Mitchell knows, and I am sure respects Siegman. I made their connection in my original posting by noting that Mitchell was an honored guest at Siegman’s organization’s dinner in 2009. Siegman’s essay in The Nation was an opportunity to get others to read him. I have linked to the Nation’s piece, and to one of his columns in Ha’aretz. My statistics page indicates that some readers, not enough, are actually going to those links and possibly reading the full text, from which I have quoted sections. I hope more will do so. My blog is intended to be less political action and more educational outreach to people who know the issue, as well as those who want to learn more. Mitchell does not need me to tell him to “call in” Siegman; though if he would read the posting and be inspired to do just that, I would be most grateful. I want my readers to be informed on the issue. Siegman is someone we should all know, read, and promote. It is in this educational sense that I suggest Mitchell would find new avenues available to shake up the Israelis by letting Siegman’s insights find their way into his thinking and into the reports he makes to Obama. The way to support my endorsement of Siegman is to get the word out that he is a veteran Jewish author, highly respected in the peace camp, and not favored by the Zionists. Attention should be paid to Siegman by the peace and justice community. You are welcome to print my essay on Siegman and circulate it further, source line added, of course. That helps get the word out. Siegman joins a line of such thinkers and influential people that I try and get people to notice. Tony Judt is another one. I still get visits to my Judt posting from last October. Some days there are so many that I have to check Google to see if he has had a medical episode, since he has some medical problems. I am thankful to report no bad new from Google. Among the people I recommend to my readers, Siegman happens to be someone I have known in the inter-faith community from back in the 80s. He was, and remains, a gift to the dialogue, a Jewish official who has run a major Jewish organization, and someone who understood the Palestinian narrative during a time when few American Jewish leaders dared acknowledge its existence. Thank you for referencing Henry Siegman’s contribution to our ongoing discussion of American compliance in Israel’s colonial enterprise. Many of us are praying that our President will “get it” and begin telling our “friends” that the occupation phase of the establishment of Israel must draw to a conclusion; that we prefer a one-state scenario with one person/one vote as in other modern democracies (that the democracy for Jews only is an anachonism); that we will no longer continue subsidizing the present modus operandi; and that we are giving them a time-table to show measureable benchmarks toward this goal. And another thing, Mr. President: be willing to face political suicide when you make these moves, until the “truth” gets out more into the open and people realize the “truth” that has led you to these necessary steps. “If we had anticipated these political problems….. we might not have…..” What an admission of crass amateurism! Obama, alleged off-spring of the vaunted, Cook County take-no-prisoners abattoir of a political machine, when Netanyahu neutered you in the public square for all the world to see, the ghost of Richard Daley pere diluted the Chicago River with his tears. Even Capone and Dillinger choked up in consternation. Prolonging the metaphor, we remember Don Corleone advising his son: “Learn to think like your enemy thinks”. So Barack if you can’t grasp how the Ashkenazis think and maneuver then get people who can. I’ll go on record here of volunteering for the task. I fear that Siegman is not in, or perhaps even close to the White House, because the White House cannot afford politically to let him be. The political barriers, the bulletproof, bilateral support for the AIPAC/Likud agenda in our congress that Siegman references assures that that will continue to be the case. I would read again Eileen’s quote from Halper in the last comment — this change will have to come from the people. Call it changing the wind. Call it providing the political cover for Obama to risk taking the steps that he needs to take to push back on Israel. Both you and Cotton come from and remain strongly connected to the churches. That’s where the power lies to change the political wind in this country. This movement already exists within the major denominations, in small but stubborn and determined groups, and something is stirring in the evangelical camps as well. In solidarity with the Palestinian call for the academic and cultural boycott of Israel (2005), and is coming now out of the Palestinian churches — see the Palestinian Kairos document, the increasingly stirred conscience of the churches in the U.S. and on a global basis will continue the inexorable growth of the movement to bring about the end of Israeli apartheid. And the beginning of some hope for the Israeli society that might begin to be born, whatever Israel becomes as part of a Middle East at peace. Norma Lee, the White House invites letters and emails, info may be found at: http://www.whitehouse.gov/contact. My advice: keep the message short. Feel free to reference links to blogs. Jim, thanks for the information and the many responses from your readers. I am still waiting for the Martin Luther King, Jr. of the “special relationship” vendetta, working through the churches, to break the impasse. Henry Siegman sounds like the right person to do this. But his efforts will fail, as have all others, unless the people of the United States come out strongly for change. Obama will not change unless he sees a large minority of people who oppose the “special relationship.” In this regard, what is needed in the White House is a cultural change to match a popularity uprising, not simply playing musical chairs. I believe there will be no cultural change as long as Rahm, Obama’s senior advisor, remains. Jim: I – as a former Republican Member of Congress for 14 years and one who voted for Obama for President am deeply saddened by the President’s cave in to the Israeli lobby. I really thought that our President had the intestinal fortitude to stand up for an even-handed settlement of the Israel-Palestine issue. Doesn’t the President know that 70% of all the conflicts in the world can be traced back to the Israeli-Palestinian endless conflict? Doesn’t he understand what his inaction means to the welfare of our nation? To our children and grandchildren? To the future of America?I am so disappointed in our President. Harris Fawell, member of Congress, retired, 1999? thank’s u post, i like this. I can only agree with the above studied comments. We badly need a leader with the honesty and integrity lacking in Obama or in any of the leading Republicans. We need someone at the helm who is courageous and principled, such as Dennis Kucinich. I too can only agree with the above studied comments. I differ, however, with the last William only in the reality spoken by Gepford. Movement toward peace can only happen if strong support for Obama by people like us is given to do the tough jobs like replacing Rahm as Senior Advisor.